When people think of basketball powerhouses in New York City, Christ the King is one of the schools that come to mind. The school, located the Middle Village section of Queens, has produced countless Division I players and NBA players in Khalid Reeves, Erick Barkley, Lamar Odom and Craig “Speedy” Claxton. In the last six years, the Royals have won five CHSAA city championships and three New York State Federation championships under head coach and athletic director Joe Arbitello, who is also an alumnus of the school and was a senior on the 1994-95 city championship team with Odom. In the midst of the current dynasty at Christ the King, there have been many players that have gone on to play at Division I colleges such as Marist, Kent State, Iona, George Mason, St. Francis (Pa.) and UConn. But for all of the marquee names, there were also hidden gems there that made their presence felt, despite being overlooked. One of those players was Jared Rivers. Rivers, a 6-2 guard from Westbury, NY, was one of the Royals’ best guards and shooters. His legacy at Christ the King in his three years on varsity included being a part of 1,000-point club, winning two CHSAA titles and a New York State Federation title as a sophomore in 2013-14. This past season, he averaged 17.3 points a game and was the leading scorer on a Royals squad that went 19-9 overall and reached a berth in the CHSAA city semifinals. On August 2nd, Rivers signed a letter of intent to attend Division II LIU Post, after turning down offers from three Division I programs in Maine, Binghamton and North Carolina A&T, something that is deemed unheard of. 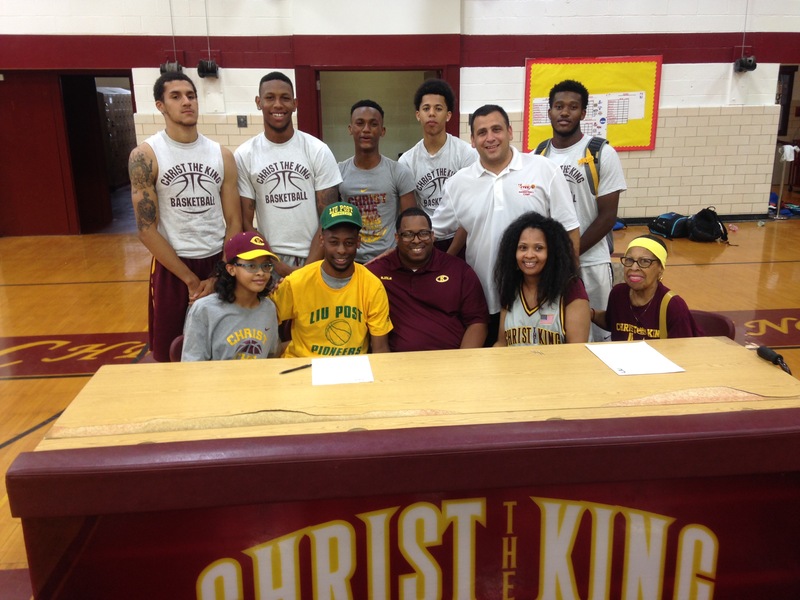 He will be one of two players from Christ the King suiting up for LIU Post this year, as the other is his high school teammate, Tracey Cleckley, who is also a recent graduate of CK. What makes you successful in the game of basketball? What makes me so successful is that play so hard on the floor, my ability to shoot from long range and I’m competitive and I always love to win. What does Christ the King mean to you? Christ the King means everything to me, it’s such a storied program, a lot of great players, a lot of great people here. It’s a blessing to have been a part of it. What does it mean to have won championships at a place like Christ the King? It’s amazing. Some of the big-name players that came through there never won one, I’m so thankful that I got two or three. It’s just a blessing, it’s an amazing feeling. I’m glad that I was able to win so many. How does it feel to be going to a school such as LIU Post? I mean, it’s great. I’m in a great situation, there’s a great coaching staff. I have the opportunity to play right away, it’s such a great feeling. I have the chance to play college basketball for four years. You had a couple of Division I schools offer you and you turned them down, what made you decide on LIU Post as the best place for you? One of the reasons I chose LIU Post is because I was comfortable with them and I have a chance to play right away and they had plans for me. I don’t have to worry about classes coming in or out. I can be freely and play my way and I know the coaches will have my back for four years. What will you major in at LIU Post? I’m probably going to major in education. What will you bring to the LIU Post program? I’ll bring my competitive spirit, I’ll bring my shooting, my defense. I’ll just bring everything I have, I do everything so well that I think I bring everything to the table. What’s next in the future for Jared Rivers? What’s next is going to LIU Post and bringing them a championship.